In my experience I find that it is not always better to be younger. I often see people who are older in much better shape, or more resilient than their younger counterparts. Even clients beyond 50. Whereas I see some young people who are in a very poor state of health and have to speculate when they get into their 50's, their health will be much worse than the 50 year old's of today. There are 2 different issues both populations are dealing with, and let's not get them confused. 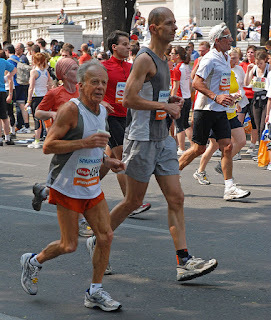 The older population is dealing with atrophy (a shrinking of muscles) whereas the younger generation today have a different issue, there's is not of atrophy, it's an issue of never having developed their musculature in the first place. The older generation had a more robust childhood, being outdoors, sports, working, and didn't have all of the modern conveniences. All these little things add up or take away. Now as they got older, the world changed and things got easier for them which helped speed up the atrophy and then products specifically designed to make life easier for the elder population emerged. With the younger generation, not only are there diets worse, but now its so simple and easy to tear open a bag, or a can. They don't walk, they have scooters, skateboards, or better yet because parents don't feel safe anymore with their kids being outside, they will just get dropped off. To make sure the parent can keep an eye on them, they insist they stay in at play at home on their Xbox. They only grew up in a world where things were easier and technology kept trying to make it easier. I am a product of the 80's and even then walking a mile to school and back wasn't that big of a deal. It reminds me of the butterfly analogy. As a butterfly is coming out of its cocoon, if you opened the cocoon for them, the butterfly will never be able to fly because it never had to develop its wings, it never had to push oxygen and blood to the ends of this body. Permanent atrophy. As opposed to an older butterfly who did break the cocoon open. It may not fly as well anymore, but it can still fly. Speed diminishes but strength is one of the last things you lose. It's why people who compete in the world's strongest man contests are much older than a typical athlete. And the strongmen who can rip phone books apart can perform even to age 80 and beyond (I saw one strong man in his 90s). I often like using the example of 2 cars. One is a younger model without an engine. The other an older model that still has a big working engine. Childhood is so fundamental for overall health, especially later down the line. Kids need to go out and play, skin their knees, play sports, tumble, and just be kids. And eat real foods not foods convenient for parents to buy. In training of the two populations then, these issues shouldn't be confused and you need a trainer who can recognize it. One population needs to develop that general physical preparation first before you can work on anything else. Forget weight loss for now, we have to get them to move well before we can get them to move a lot. With the older generation its about re-igniting their old instincts, reviving their nervous system, and controlling their diet and reverting it to what it may have been in the past.